Copywriter Jim Wright travelled to Port Hope to track down a legendary burger joint. Sometimes you find the best food in the most unlikely of places. And by “best” I actually mean THE best. Last year Canadian Living magazine ranked Port Hope, Ontario’s Olympus Burger at #1 on its list of the 10 best burgers in Canada. This followed hot on the heels of an appearance on Food Network Canada’s You Gotta Eat Here. 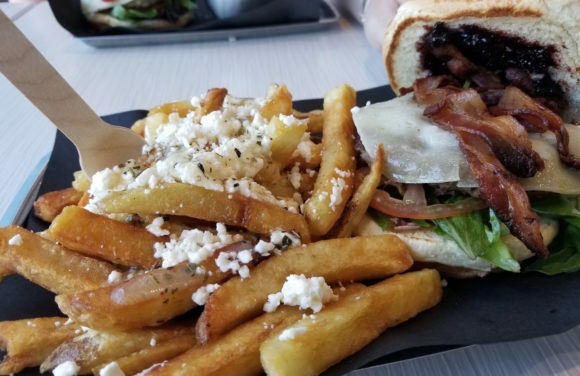 Host John Catucci declared the signature burger was, “incredibly delicious.” Not bad for a small town restaurant that’s only been open for five years. But neither of those were my primary reason for making the trip out to Port Hope. I wanted to see what a carbon-neutral restaurant looked like. While researching an article I was working on, I happened across a blurb on the Foodservice and Hospitality website. The short piece announced that on April 18, 2018, Port Hope’s Olympus burger became the first restaurant in Canada to be Carbonzero-certified. Carbonzero is a Toronto-based organization that helps companies reduce and offset their carbon footprint. Their aim is to make carbon reduction accessible and cost-effective for Canadian businesses. Tasty burgers and carbon-neutral? Order up! Through conversation with owner George Kallonakis, I learned that his inspiration to go green came from a shark. While snorkelling in Belize, he witnessed a shark spit out a piece of plastic. Plastic in the oceans is a problem many of us read about, but few see first-hand. That was the tipping point for George, who had already been thinking about ways to up his restaurant’s green game. “I knew, coming back from Belize, I had to be more active and follow through with more environmentally conscious alternatives,” George told me. All plastic materials got the boot. 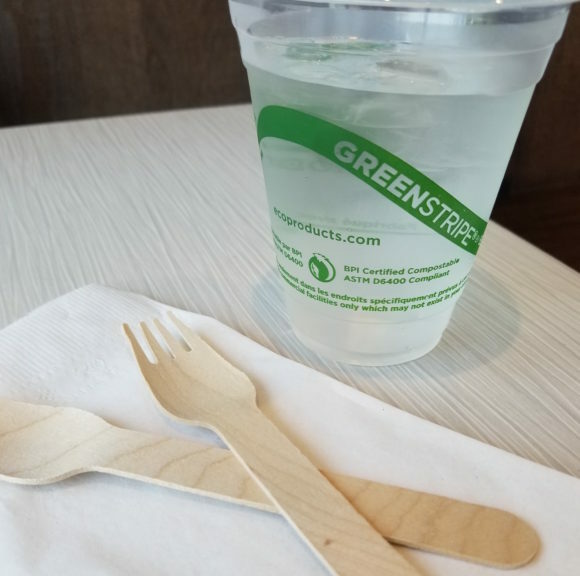 The straws are now paper and dissolve within 48 hours, takeout containers are also paper, knives and forks are wood, and drink cups are biodegradable. Meat is locally sourced. Even the building is eco-friendly, with LED lighting, enhanced insulation and reduced air leakage around windows. As far as emissions go, which are impossible to avoid, Olympus Burger purchased carbon offsets that support forest management on the Niagara Escarpment. As you might imagine, a green initiative of this scope comes at a cost, despite Carbonzero’s mandate. George says it costs him close to 300% more to purchase eco-friendly supplies than to use standard restaurant material. My wife and I headed out to Port Hope on a sunny Saturday to satiate our beefy cravings. The first thing we noted was that the restaurant itself was repurposed. The giant bucket on a pole gave away the building’s past life as a famous fast-food fried chicken franchise. Off to a green start! 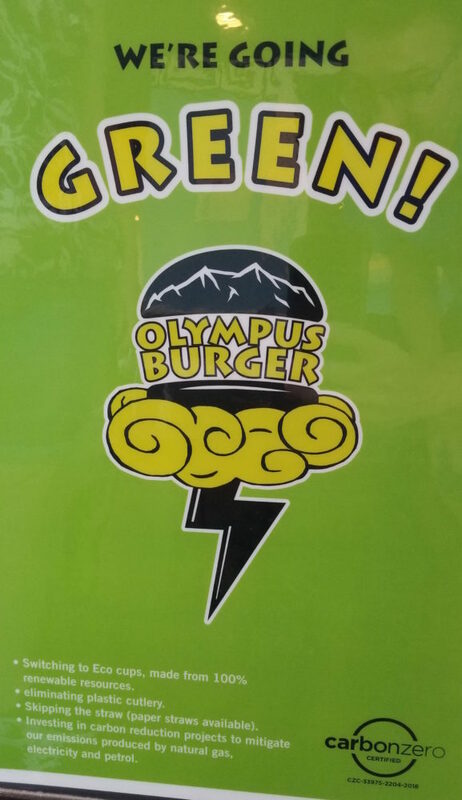 Olympus Burger got its name from George’s Greek heritage. The theme is carried right through from the decor (subtly Greek, but not in-your-face) to the menu. Each burger takes its name from a different character from Greek mythology. The Hades is hot and spicy, the Poseidon is a salmon burger, and so on. Love the sense of humour! There are many nods to Greek cuisine in the toppings, too. Both my wife and I had saganaki on our burgers. The King Midas comes on “golden crisp Greek pita bread.” You can even get feta on your fries. Despite the dizzying array of burgers and toppings (Montreal smoked meat, waffle buns, guacamole, fried eggs - and the list goes on), the real star of the show is the patty. I ordered the Odysseus, which consists of a 6 oz. patty, saganaki, bacon, lettuce, tomato, and blackberry jam. I tried a bite of the patty on its own, first, and it was exceptional. You could eat this burger plain and walk away totally happy. The saganaki was warm and gooey, and the sweetness of the jam added a bit of bright perkiness that I loved. I also appreciated the patty size. Bigger is not always better, and there’s something to be said for being able to finish your meal. I suspect it reduces food waste, too, not serving ridiculously large portions. My wife went with the Achilles. Her burger also featured saganaki, lettuce, and tomato, but finished in gourmet style with roasted red peppers, and olive oil & herb aioli. She was a happy lady, let me tell you. On top of the great food, the service was also excellent. Though you order and pay at the counter just as you would at any fast food place, they bring your food to the table for you. I was pleasantly surprised when we were visited multiple times by our server for drink refills, condiments, and just to see how we were enjoying our meal. I know what you’re thinking, but you’re wrong; George didn’t even know I was there until after we ate. Port Hope is a little out of the way for most people, but it is more than worth the drive if you appreciate a truly legendary burger experience. Plus, you can walk away feeling good about supporting a business that in turn supports the environment. Olympus Burger is located at 55 Mill Street South in Port Hope. You can check out all they have to offer at their website.